Turkey hunting is a New Hampshire tradition, one that we strive to pass on to present and future generations. 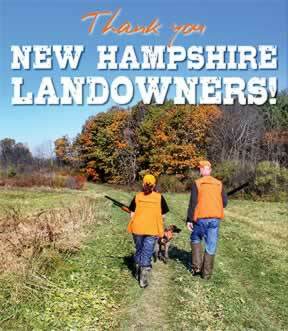 With greater than 70% of New Hampshire's land under private ownership, the key to a quality hunting experience for most of us is the ability to access private lands. If we are to maintain the rich New Hampshire turkey hunting tradition, it is important to remember that access to private land is a privilege provided to us through the generosity of the landowner. If your request is denied, be understanding and remain polite, whether or not the landowner explains the reason for the decision. Often times you will find that the landowner does allow hunting, but is denying permission because they have already granted permission to a number of hunters. Other times the landowner may feel hunting will interfer with other land uses that are occurring on the property - such as building a house or a forestry operation. If you are bow hunting, always retrieve your arrows. Use caution when hunting in fields, as a lost arrow can cause injury to the farmer and farm animals or damage to equipment. If you are a first time turkey hunter, make an effort before the season to learn as much as you can about the sport, as inexperienced hunters often create landowner conflicts. Learn more about Turkey hunting from Fish and Game HERE. In addition, there are a number of videos, which provide an excellent introduction to turkey hunting. Through joining organizations such as the National Wild Turkey Federation, you can meet experienced turkey hunters who will help to introduce you to the sport. For many of us, one of the most exciting and memorable experiences of the season will be mentoring a young hunter. As part of the mentoring process it is important that they understand that if we are to preserve our hunting heritage, we must respect landowners and their land. Consider providing them with an opportunity to ask a landowner for permission and to express their appreciation after the trip. Remember that through your actions, you represent all hunters. The impression that you make not only determines if you have a place to hunt, but also that of your fellow hunters. Always be the best ambassador of hunting that you can be in your actions and words. Turkey hunting is a New Hampshire tradition, one that will only continue if we all follow the basic principle of landowner relations: Treat the landowner as you would like to be treated and treat their land as you would like yours to be treated. 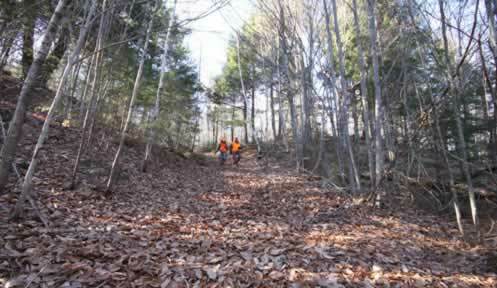 As you enter the woods on opening day, take a few moments to reflect upon the partnership between Fish and Game, the National Wild Turkey Federation, hunters and most importantly private landowners which has provided you with this opportunity and consider what you can do to ensure that this opportunity will continue to be available for future generations.